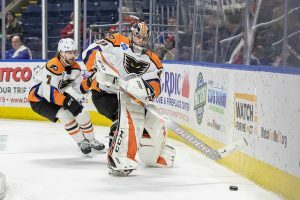 Bridgeport, Conn. – Rookie goalie Carter Hart dressed in a Phantoms jersey for the first time since December 15 on his first game back with the Phantoms. After Hart shined in the first period with 20 straight saves, the Bridgeport Sound Tigers eventually broke through to post a 4-1 win in the last game before the AHL All-Star Break. 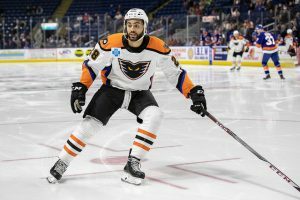 Justin Bailey (11th overall, 2nd with the Phantoms) scored for a second consecutive game while Bridgeport was paced by the AHL’s leading active career scorer, Chris Bourque, who posted two goals and one assist. Kiefer Bellows added a goal and an assist as well. Lehigh Valley (24-16-5) had a six-game point streak at 4-0-2 come to an end as Bridgeport (24-16-6) nudged just ahead and back into second place in the ultra-competitive Atlantic Division race. The two teams will rematch back in Bridgeport next Friday in the first game back from the AHL All-Star Break. Hart’s appearance with the Phantoms was partly designed to help shake off any rust from the long layoff recently enjoyed by the Flyers with the team’s bye week and NHL All-Star Break running back to back. He had to be on top of his game right off the jump as the Sound Tigers fired away nine shots on goal in the first four minutes. Hart wowed the crowd with a spectacular glove-save pulling the splits and snagging a back-door shot in his glove to somehow rob Travis St. Denis. Hart appeared strong right from the start and perhaps his time at home in the Edmonton area helped him recharge. The Phantoms were finishing off a busy stretch of games while Bridgeport was fresher having not played since Wednesday. The Sound Tigers broke through early in the second period after an intercept at center sent first rounder Kiefer Bellows speeding over to the left wing where his snapper from the dot beat Hart on the stick side for his 11th of the season. Bellows had scored on October 6 at PPL Center for his first professional goal and also the first goal ever allowed by Hart. Lehigh Valley responded about 10 minutes later at 12:08 into the second period when Misha Vorobyev’s connection up ice sprung free Justin Bailey on a breakaway which he converted for his second goal in the last two games and his 11th overall this season including nine with Rochester. 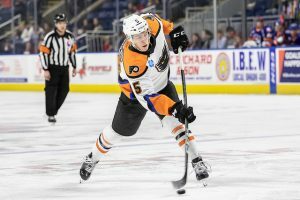 Vorobyev has participated in all four goals the Phantoms scored in the Friday and Saturday weekend games with one goal and three helpers. Bridgeport retook the lead less than two minutes later on snappy transition through center leading to rookie Otto Koivula from the left dot dropping for Bourque in the high-slot who hammered home a big one-timer off the bottom of the crossbar for his eighth of the season and a 2-1 lead for the hosts. Carsen Twarynski had a breakaway that drew a hooking penalty and induced a power play and the Phantoms had several other strong chances including from Tyrell Goulbourne, Colin McDonald and Mike Huntebrinker in a period that produced a 16-7 shot advantage but the Phantoms were unable to score more than the one marker. Bridgeport extended its lead with 7:05 remaining on a point-shot by Kyle Burroughs (3rd) that appeared to deflect off a Phantoms and bounce through between the legs of Hart to push the score to 3-1. Chris Bourque’s empty-netter (9th) with 1:24 left completed the scoring for a 4-1 final. Now Carter Hart turns his attention to the upcoming games with the Flyers. The Phantoms finished at 0-for-5 on the power play while Bridgeport was 0-for-3. Lehigh Valley now steps out for the AHL All-Star Break while Greg Carey and Colin McDonald head to Springfield, Mass. to represent the team. 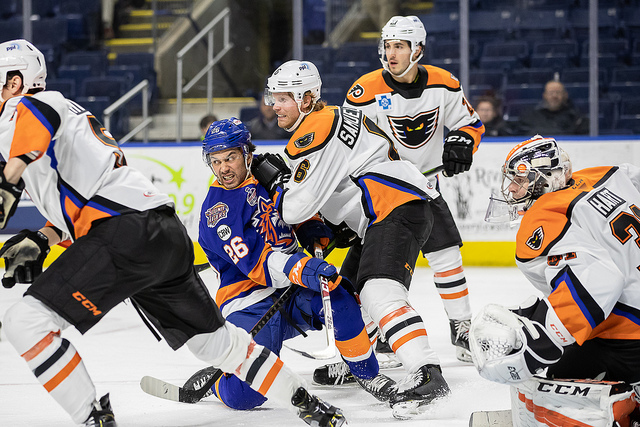 The Phantoms return to action on Friday, February 1 with a rematch at the Bridgeport Sound Tigers. The next home games for the Phantoms are Saturday, February 9 at 7:05 p.m and Sunday, February 10 at 3:05 p.m. in a two-game set against the Hartford Wolf Pack. 1st Period- No Scoring.Penalties-Palmquist Lv (hooking), 9:50; Palmquist Lv (high-sticking), 15:46. 2nd Period-1, Bridgeport, Bellows 11 2:02. 2, Lehigh Valley, Bailey 11 (Vorobyev), 12:08. 3, Bridgeport, C. Bourque 8 (Koivula, Aho), 13:47. Penalties-Helgeson Bri (slashing), 4:35; Bellows Bri (holding), 14:28; Dal Colle Bri (delay of game), 17:44. 3rd Period-4, Bridgeport, Burroughs 3 (Bernier, C. Bourque), 12:55. 5, Bridgeport, C. Bourque 9 (Bernier, Koivula), 18:36 (EN). Penalties-Jones Bri (tripping), 5:21; Goulbourne Lv (roughing), 13:45; R. Bourque Bri (slashing), 19:12. Shots on Goal-Lehigh Valley 5-16-8-29. Bridgeport 20-7-9-36. Power Play Opportunities-Lehigh Valley 0 / 5; Bridgeport 0 / 3. Goalies-Lehigh Valley, Hart 9-6-2 (35 shots-32 saves). Bridgeport, Smith 13-8-2 (29 shots-28 saves). Referees-Jason Williams (18), Jonathon Sitarski (23).